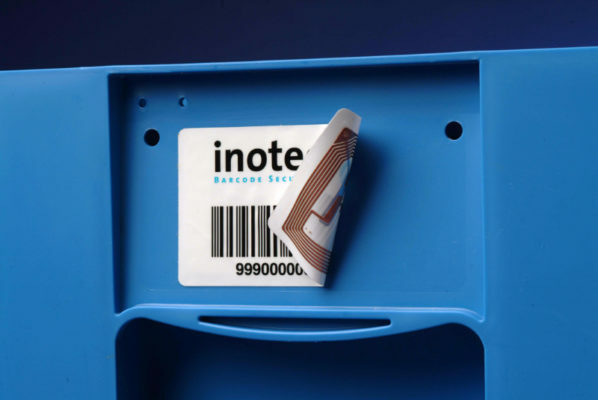 inotec introduce a new High-Temperature On-Metal RFID label, – designed to work directly on metal surfaces. With adhesive attachment, on-metal capability, good reading performance and resistant to temperatures from -40°C to +230°C, this low profile label is ideal for Automotive and industrial applications, filling a gap in the market where bulkier, more expensive hard tags have proved prohibitive. The extreme heat actually helps the adhesive to bond intensively to the metal, allowing the label to remain permanently fixed to the carrier. The transponder is embedded safely inside the label construction, protected from both heat and liquids e.g. diesel, antifreeze or brine. The label has been rigorously tested at inotec’s in-house research and development Label Competence Centre, to meet the temperature and performance requirements of the automotive industry and various industrial applications. The label has also been tested on the ‘Voyantic’ Tagformance system, the industry de-facto standard in UHF RFID performance measurements, used by many of the leading tag manufacturers, universities and system integrators. The RFID inlay (UHF EPC Class 1 Gen2) provides an optimal read range for on-metal applications. Depending on the reader system and on the environmental conditions a read range up to 2.5m can be achieved. There are different variants of the label available: single labels, RFID sets, in stacks or specifically packed. The labels can also be personalised – pre-printed and encoded. Full product details are included in the corresponding technical data sheet which is available on request.